"SO SO SO sorry but please be patient," Molyneux tells Curiosity players stymied by server troubles. "Curiosity will be out on 7th November" Peter Molyneux Tweeted last week, and this week those are looking suspiciously like Famous Last Words, as progress is being held back by technical issues. More than 158,000 users downloaded the app within the first 24 hours of launch, and this influx of players has crushed Curiosity's servers. Problems include long loading times and lag, which is being dealt with piecemeal as the 22 Cans team tries to keep up with demand. Molyneux's six-strong team are doing its best, but it's an uphill battle, particularly since the updates have to be made live. 80 million cubes have already been tapped away, according to Molyneux, and more are being chipped every second; Molyneux says he is "praying to the gods" that everything holds together. "What we've learned so far is amazing and we'll share all of this but first we must fix the problems," Molyneux Tweeted. "SO SO SO sorry but please be patient." The whole point of the game, from Molyneux's perspective, is to gather data, as part of a larger social experiment. Molyneux wanted to see how far he could take social and free-to-play gaming; looks as though he now knows just how far. A little over three million cubes remain in the first layer. With billions of cubes yet to go, the experiment has a way yet to go before it's done. Hopefully the servers will stay the course. So I'm curious, what is this? ...but has anyone bought the magic pick yet? Someone probably did, the servers crashed and they lost the data. Ahh, good old Peter Molyneux. Over-promising and Under-delivering since 1997. Still, I didn't expect the disappointment from this title to hit until someone had seen the center of the cube. I guess even Molyneux didn't expect many people to be interested in this particular strand of crazy. This seems to be happening a lot--companies either underestimating their games' popularity or overrating their servers' capacity or both. 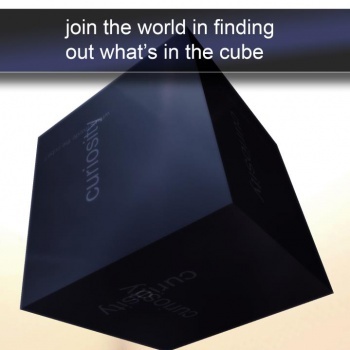 Is Curiosity really that popular? my guess is that Schrodinger's cat is in the middle of it, but now did curiosity kill it or is it still alive? We'll only know when it's open and we can see it. I'm sure lots of people will download it, click it a few times, decide they'd rather play cow-clicker (or otherwise waste their time somewhere more rewarding), and the whole project will fizzle in short order, long before the center is reached. But I am freakin excited now to see the acceptance and participation of this. It just rocks my research jollies to think of what kinda of data they could get from this. Just saying Molyneux... those results better be published publicly... No pay-to-views! Am I the only one who's thinking it's somebody's bot-net? I don't think we'll ever get there, people will get bored after spending hours and hours and only getting 2 layers down. My puny 3GS can't handle the game! It seems the realtime "picking" is too much for its processor and/or internet. If I keep to a place nobody else is chipping away at, I can stay on for a while. But then my game crashes when someone comes over. It's an interesting coin system they have. I can't buy anything because the button is still greyed out, but I guess it's a neat system with combos and such. About half way through the 2nd layer. While I do casually wonder what's in that Curiosity box of his, I can't help but look forward to seeing how much rage will be tossed at Molyneux when it ends up disappointing. Then again he may surprise me... You never know. Also appearantly captcha thinks that the box contains "Zombie prom".